Like a rose that blossoms out of a sidewalk crack, Tagine sweetens the NYC theatre district with an exotic and alluring perfume. Moroccan lamps, handwoven berber textiles and cushy seating create an understated elegance. 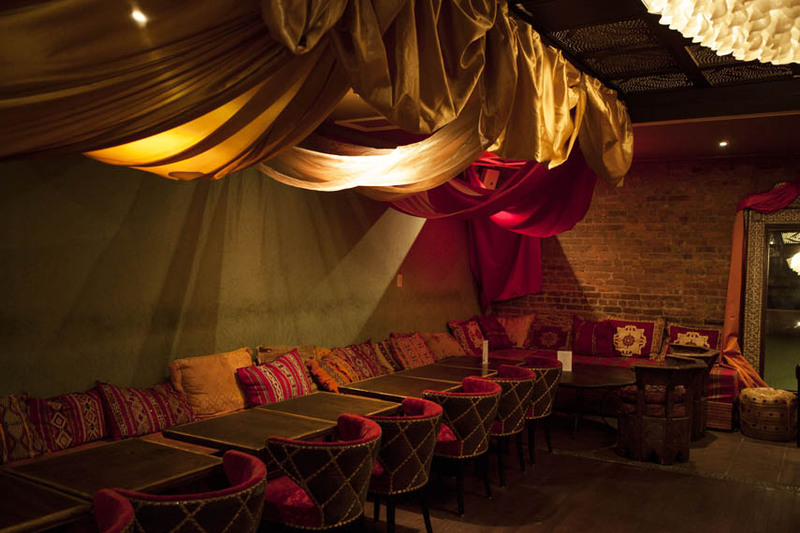 Habitues of the restaurant/lounge steep themselves in the Maghreb, sipping luscious orange blossom sangria, savoring fragrant tagines, entranced by belly dancers and hookah pipes. What a shock to step outside, following this amazing melange of sensory delights and find not camels and dunes, but rather midtown Manhattan! Aside from the beautiful and comfortably decorated interior, Tagine's kitchen is dynamic, baking its own semolina bread daily, and encasing its own lamb merguez. A variety of 'Tagines' are featured at the restaurant. There are several different cous cous selections on the menu, and mouthwatering house specialties include "bastilla", a Moroccan pheasant pie, and "moquadimat," a selection of appetizers, ordered a la carte or as a mixed platter. Included in the wine list, is a diverse selection of Moroccan varieties, which delightfully accompany the menu. Don't walk away from your table without sampling "Halahwyat" the most delightful, hand rolled traditional confections and pastries, graciously served with mint tea or Moroccan spiced coffee. We have been hosting, catering and entertaining palates and bodies for over 12 years. Our new location boasts a generous bar, hookah lounge, semi private room and, as always, one of the lasting live music venues in Manhattan. Our concept is the cohabitation of flavors, aromas, palettes and palates:) The merging of cross cultural arts, artists performances while dining on slow, authentic and artisanal cuisine is our mission and brand. Hence our namesake, Tagine- Share the Experience. We are the only artisanal Moroccan restaurant that has a variety of gluten free dishes on our in-house menu as well as an executive chef who can accommodate any dietary request.